"Tip me over and pour me out." 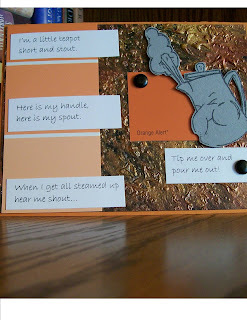 In keeping with this dark side of my personality, I decided to create this card for Paola's What Song Are You? card swap on Splitcoast Stampers. It really was a lot of fun to create. I used found items (paint chips) and a creative technique (heated pearls). I have met - well, chatted with online - some of the neatest people on splitcoaststampers. DJ is one of them. She is my cheerleader, my mentor, my friend! 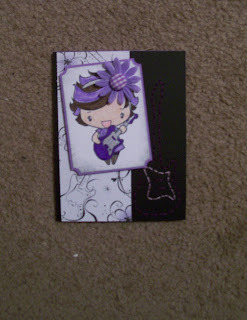 I'm currently in her I Got the Music in Me card swap. This morning, I woke up very early, after only three hours of sleep... and I decided to make another card for her swap because I had a stamp I was eager to use and it fit the theme. After creating for a while, I woke up enough to realize I hadn't asked for a second spot... so I went to SCS to see if she'd let me have another spot. That's when I saw it - her swap was officially CLOSED! But, Dj, being the kind, sweet, caring, incredible person that she is (or greedy, after all she'll get one of these cards, too - Just Kidding, DJ!!!! ), said I could have the second spot. Whew! Crisis averted. Ha! 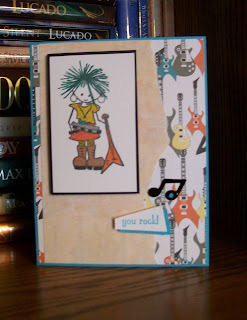 Here's the card I created, using the Bella tiddly inks stamp that is called allpunkedupandnowheretogo. She's fun! Just like my friend DJ!!! Here's the card I made for a young lady's birthday. I hope she likes Rockstar Anya! I made this card for DJ's I Got the Music in Me swap. I'm sorry, but the picture is too dark to really see the stitching. 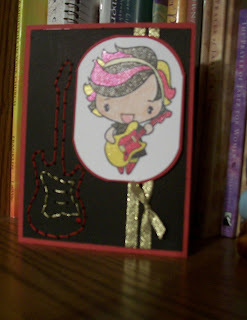 That's a hand-stitched guitar on the righthand side of the card. The stamp is such fun. It's Rockstar Anya by The Greeting Farm. I made another card with the same stamp, for a young lady who is celebrating her 13th Birthday. I'll post it, too, in a little while... so check back in a bit to see it.